Earlier this fall, restoration work began on Constitution Hall and I’m excited to be able to share with you more information about this important project which we are undertaking. In recent years, much of our restoration work has focused on Memorial Continental Hall but now we must shift our attention to Constitution Hall. Into its 86th year, it is important to preserve Constitution Hall so that future members will also be able to experience the awe of coming to Continental Congress in this beautiful building. Additionally, we must meet the demands of the many thousands of other public visitors to Constitution Hall each year that come for public and governmental events, school graduations, performances and other happenings that draw individuals. We take pride in showcasing our grand facility that is considered the premier venue of this sort in our Nation’s Capital. Although an urgent project to address critical failures in the lobby ceiling and in the behind-the-scenes mechanical (heating, cooling, lighting, etc.) and life safety systems, opportunities have presented themselves to also revive the historic character of the building’s public spaces. This is specifically focusing on the 475-foot-long lobby and the President General’s Reception Room, and is intended to reflect the architecture and aesthetics of the original period of design and construction. Of course any project of this sort is rife with challenges due to the building materials and paint used prior to the 1970’s, but you can be assured that our team of historic restoration professionals are paying close attention to potentially hazardous materials that typically build up in a historic building like ours to ensure we are in compliance with all local and Federal building codes. We have once again retained Quinn Evans Architects (which worked with us to restore the DAR Library’s historic lay light) for this mighty restoration project. Their analysis of the Hall’s historic paint colors, light fixtures and decorative elements revealed that, over time, features of the original design have been compromised by modernization and deterioration. 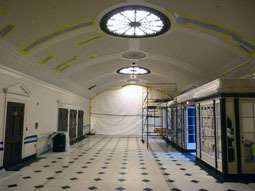 For example, retrofitting the lobby’s historic light fixtures to use modern light bulbs has affected the intensity of the lighting in that space. The changes being made in this project will correct that issue. Additionally, some of the leather-wrapped doors leading to the auditorium show bubbling and delamination. The low-relief decorative plasterwork that highlights the lobby’s pediments and arched ceilings provides another example. These embellishments are now coated in a gilded bronze finish, and repeated applications of paint have built up on their surface. 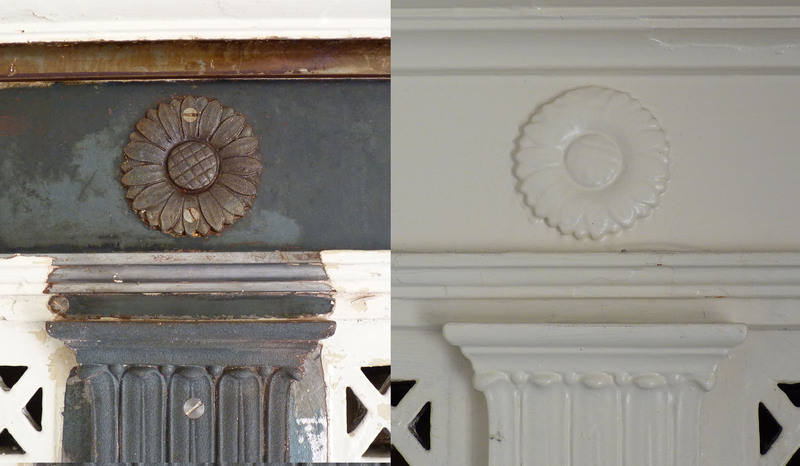 Part of the efforts will be to determine the level of detail that can be recaptured by stripping away this buildup, which has partially obscured the original decorative elements. Here’s a slideshow of some of early work and spaces that will be focused on in the lobby. I’ll keep you updated with the progress of the restoration work! The Guardian Trust Campaign is a two-fold effort to meet the immediate restoration needs at Constitution Hall while also establishing a permanently restricted endowment to ensure that our exquisite complex of buildings are always taken care of. 80% of all donations received through this campaign will establish a permanently restricted fund to support the preservation, restoration and conservation of our historic home well into the future. What our Founders Built, We Must Preserve! I can’t thank you enough for your support of this historic and much needed campaign.